Berlin G. Myers Lumber Corp. is proud to offer our customers one of South Carolina’s largest selections of finished lumber, hardwoods, and exotic species. From some of the finest C&Better Southern Yellow Pine that is cut and milled locally to some of the rarest species from around the world, you can find the perfect piece of finished lumber for your project. Southern Yellow Pine is a very popular lumber that is grown all across the southern region of North America. SYP is very stable, machines well, and is often used as siding, paneling, millwork, and flooring products in its finished form. The treated version of SYP also machines well and is often used as siding, paneling, and millwork. Numerous outdoor materials including decking, flooring, and outdoor furniture products are made from treated SYP. Cypress is a common tree grown in the southern areas of North America. Cypress is a strong, rot resistant, and easy to work wood that tends to have a light yellowish brown color. It is often used for interior and exterior products including paneling, siding, furniture, and decks. Native to Western North America, douglas fir has a very straight grain with a creamy-yellow earlywood and red-brown latewood lines that give the wood an overall orange cast in color. Douglas fir has become the standard wood of choice for timber framing and exposed beam building due to the high availability of large timber sizes. As the popularity of timber framed structures has grown the sourcing of douglas fir has become more difficult, especially on the east coast. Native to North America, spruce usually has a creamy white color and fairly straight grain. Easy to work, as long as there are no knots present, spruce glues and finishes well. 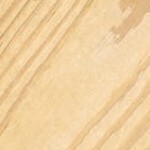 Spruce can give blotchy and inconsistent results when being stained due to its closed pore structure. A sanding sealer, gel stain, or toner is recommended when coloring spruce. Applications for spruce include: dimensional lumber, boxes/crates, furniture, millwork, musical instrument soundboards, and virtually any application where a wood material with a good strength-to-weight ratio is needed. WRC has a wide growth range along the west coast of the US and Canada. This outstanding exterior species is naturally rot resistant due to high levels of extractives which act as a natural fungicide. The beauty of WRC is in the strength imparted from its long, straight grain combined with its low density, which makes it very light. WRC is used extensively in the production of cedar shingles, exterior siding and trim, outdoor furniture, decking, and even interior millwork. It is weather resistant allows for direct contact with the ground so it is often used as fence posts, garden pergolas and sheds, as well as in trellis applications.